I am so glad he is doing well. He is so cute. Dr. Faust has a lot more experience than Dr. Selig, I think. However, in the last two years, I've been taking the pigs and such to Selig when I can't see Riggs (out of town a lot). I'm much happier with faust. Not only his work he does with the animals, but as a person, too. I just have a good relationship with him. Dr. Faust is awesome. He sees my kitties and didn't hesitate to give me a call when he wasn't seeing piggies but I wanted advice on Peggy Sue. He's an incredible person and very easy to talk to. I printed out the directions to his office already, and will definitely give him a try next time I need to take one of the girls in. I very much prefer vets who are as good with people as they are with animals. Riggs is nice enough, but not warm and fuzzy in the least. Poor Stachi, How is he doing? I am curious as to how they closed that up. Is it sutured or glued or what? It has to feel better than before. Pistachio is doing really well. The eye is glued shut. He is not on any antibiotics. If anyone would like to contribute to rescue costs, you may do so through paypal or by sending a check to our PO Box. 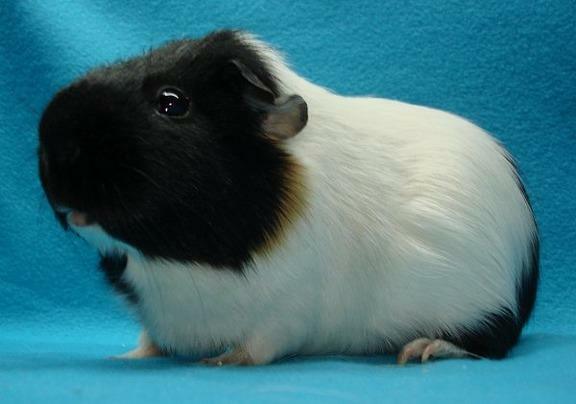 We have about 130 guinea pigs in house and roughly 100 of those are adoptable. We use about $35 a week in bedding. $28 a week in food. $15 a week in hay. Plus veterinary and other odd expenses. We've just replaced about 25 water bottles as well, which was about $110. Any contribution is very helpful! He looks great, Erin! Hope it heals up just fine. Looks like he's healing up well! Give him a kiss for me and tell him he's beautiful! Pistachio is looking very handsome even in recovery. I am not familiar with any eye-removal injuries, but the wound looks "clean and crisp". Get well soon little Pistachio! Pistachio had some pus coming from the eye yesterday. He started on antibiotics. Still looks great. He's eating like a pig and back to his old kiss-my-azz attitude we all love so dearly. I'm so glad he's recovering well. He's a handsome little guy. Very handsome guy! I love his ears and coloring. Was looking for this thread to see how long its been since Stash had his eye removed... So, update? It's been 2 years and Pistachio is still, well, Pistachio. Attitude galore, but he loves me and comes right to me to be handled (chatters and tries to bite anyone else! hahah!). His eye socket has done nothing but seep fluid for the last 2 years despite tries at several antibiotics. We finally decided just to leave it be, and let it do what it needs to do to be a happy little leaky eye. Pistachio weighs in at a hefty 3 pounds 1 ounce and loves his four male roomies. He will be 5 years old in January. His skin and coat have remained nice, no more lumps on his back since that one was removed with the eye. Hopefully he stays healthy! He's a real character and I'm happy nobody else (that could adopt him, anyway!) saw his potential and he stayed with me :) Hehe! Thanks for the update. Would you like these pics added too? One of KM's pigs had an eye removed and it never really cleared up - did not make it. I'm glad Pistachio is able to manage. You can add any of my photo's that you wish to add. I think I gave you open permission a long time ago! I'm happy he manages with the leaky socket, too. Vet and myself were worried. We've tried several antibiotics for some pretty lengthy treatments, nothing has worked. Thanks! I kinda thought so but I am old and don't like to trust my memory. Pistachio passed today. 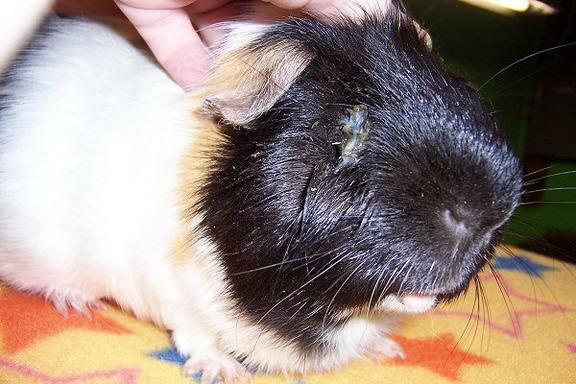 He was 6 and spent 3 1/2 of those years as a one-eyed grump. He will be missed dearly. I've never had a pig greet me with such angry chattering each and every time they saw me, yet he was happy to see me. I'm so sorry Erin. He was a real sweetie. Rest well beautiful boy. A testament to your good care and a solution to chronic problems that worked for him, even if it wasn't perfect. Godspeed and safe passage, Stash. You will certainly never be forgotten, and always loved.